Good morning, everybody. Thanks so much for dialing in today. 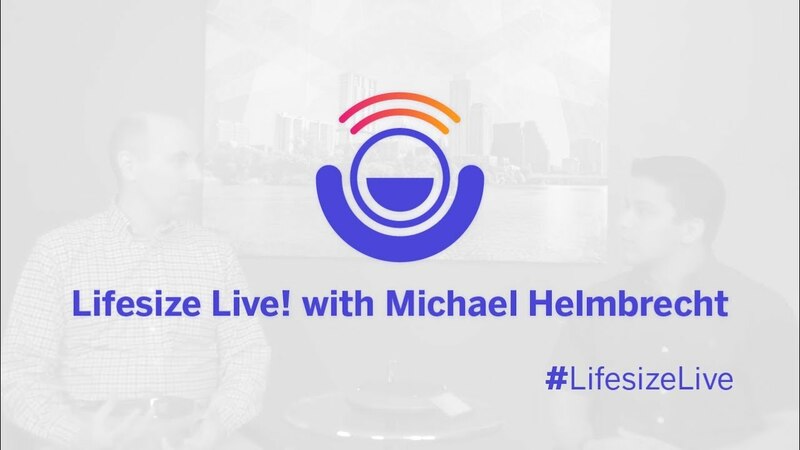 I have the pleasure of introducing you guys to Michael Helmbrecht, the Chief Product Officer here at Lifesize, and we're coming to you live from our own webcast, which is a pretty cool streaming service that we offer that allows us to use our very own platform here. So thank you so much, Michael, for joining us. Thank you very much for having me. Excited to be here. Absolutely. So today we're going to be talking to you guys about controlling the chaos and making the most out of video meetings. So Michael, you've been in this space for quite some time, huh? Wow, that's a long time. So you've seen how meetings have kind of progressed and changed from more or less in-person to video. So talk to us a little bit about some of the things you've seen change in the last 10 years, or even longer, and we'll kind of take it from there. Sure. I think video communication can be a transformative technology when people have access to it and can use it easily with whoever they need to. And that's really the biggest thing that's changed in the time that I've been in this industry. The technology has gotten so much more accessible and so much easier to deploy and use — not just internally but also with customers, partners, folks on the outside of your organization you need to talk with — that it's really changed the way the technology can be used so that it can be an everyday communication tool that people will use on their own without somebody having to set it all up. Not requiring four IT guys. Yeah, and that's the big change. When I started in this industry, the quality that we delivered at Lifesize was amazing and it's even more so today. But even though our ease of use is great, the state of the technology, particularly before you could do it with a cloud service, required that you had to do a lot of complex things — long number dials, IP addresses and other things and that really got in the way of usability. That really intimidated people, but it's all basically gone now. I mean, I can send an invitation for somebody to call me or call into a meeting of mine, and they can just join from a browser in seconds and they don't have to do anything. All of a sudden they're in a call that's more engaging and higher quality than anything they'd ever seen. And it's just a snap to get into it. Absolutely. So you've mentioned a couple of things here about ease of use and not burdening your IT staff or whomever you have to hire to do that. So, talk to us a little bit about our solution and how that ease of use and quality really transforms the meeting cadence and productivity there. Now, any user can just go in. We've got a couple of people in the room with us, and they're watching the stream very easily. I can see you click a button and it's there. So talk to us a little bit about how that ease of use translates into productivity for a company. That's a great question. We really believe at Lifesize that ease of use and making the service and the products simple to use and simple to support inside an organization matter more than anything else. And we invest a great deal of time and money in things like building up user experience design teams and investing in research and development of how to make things simple and intuitive for a first-time user, the guests that I invite to have a call with me who may have never used this technology before in their lives. They've maybe used FaceTime on their phones with their families, but in a professional setting with enterprise-grade technology, they're still using web conferencing and audio conferencing and they just didn't know that this could be this easy and possible for them. That can be really an eye-opening experience. And we're really still in the early days of adoption as a mainstream, everyday technology. The awareness of that and the possibility of that lies behind what we deliver today. And there's such an opportunity there for organizations to consolidate some of the tools they use. Most organizations still have an average of about four different real-time communication technologies they're using, which could be their audio conferencing contracts and their web conferencing contracts. They may have some old video conferencing equipment that they bought 10 years ago that's gathering dust in the corner that no one uses, and they're not getting nearly as much out of it as they could. It tends to be very internally focused and used, and there's so much more that's possible. But we believe the key is that you just have to make it absolutely as simple as can be for people to use it, to take away that barrier to adoption and the intimidation to trying it. It also has to be easy for them to communicate with everyone they meet, not just inside their companies but also their customers and partners so it's successful every time. And we do that primarily through really good user experience design but also by taking advantage of technologies and consortiums like WebRTC, which is a five-year-old technology that's part of Google Chrome. It lets us do things and build on top of it so that I can invite somebody to join me, and they just click a link that’s native to their browser and don't have to worry about anything. That can be kind of a mind-blowing experience for people. The core is that it has to be super simple and it has to be so good that I want to use it again, that I want to do it rather than getting in my car and driving across town for that meeting. And I definitely want to do it better than sitting on an audio conference call or a web conference call where it might have video but the video's almost painful to use. That's what it's all about. Awesome. So yeah, you mentioned a couple of things there about the applications and stuff like that with using WebRTC technology, but maybe we could touch on the conference room experience. I know that there are a plenty of solutions out there. I mean, there are probably 10 different competitors out there that are also doing video conferencing. How do we position ourselves outside of that, within the conference room? Well, our core — the secret sauce, if you will — is that we make great video technology that's easy to use. And it really, for us, starts from the meeting space out, whether that's a little huddle room, a little space you carve out in the corner of an open space, your boardroom or anything in between. We have purpose-built, secure appliances that pair and connect to our service as a connective device like your Nest thermostat or your FitBit — you just don't have to think about it. The software automatically updates, all the directories synchronize, they're doing centralized reporting of management for IT. So it's just a piece of cake: you're connected and you forget about it. People can just use it, and it's an experience consistent with what they would use on their laptops or mobile phones. So it makes training and the barriers to use and the barriers to support sort of just melt away. But the other part is underneath it — we have best-in-class, incredible video and audio technology in there. Like great speakerphones with just incredible clarity, really broadcast-grade cameras and encoding to make the experience terrific. As evidenced right here. We're doing it right now. Right, we're using our products and service to do this. And we tie that all together in enterprise-grade products that are secure and that have managed life cycles. And what that means isthat we have customers who routinely run our products for six, seven years, even some for 10 years. Exactly, and it's predictive, it always works, there's no virus scan running, and it's not a kit where you have to integrate it yourself or count on somebody else to put together lots of different manufacturer's products and hope that you can sustain it. You don't have to worry about that blue screen of death or anything like that in the conference room. And when it comes to consumer-grade technologies that you're trying to build into an enterprise technology, it's only as good as its weakest link, which is the consumer-grade piece that you've put in there. You're going to get two or three years out of that, whereas our products, attached to our service, are routinely getting six, seven or more years, and it's consistent with fewer hassles and global support for every piece from one vendor. With other solutions, they may have to replace and rev their technology two or three times in the same time frame, in the time frame that they would have to rev ours once. That's not just the total cost of ownership of having to buy over and over; it's the disruption of doing it and integrating each time, it's the more complex support, so it sets us up in the place where having the hardware and the software and the service, purpose-built and just perfectly linked, means it's a better total cost of ownership by far and a better value over time than anything else on the market. Absolutely. So a couple of things left just to wrap us up, just kind of a little overview or summary of how video is changing meeting spaces. All right, well, it looks like we're out of time here, but thank you so much, Michael, for meeting with us today, talking about controlling chaos, making sure that nobody's really wasting time, like you said, with travel and stuff like that. But we would love to hear more about this from you, and thanks so much for joining us. Hope everybody has a great day. Thanks for having me. I really enjoyed it.